The new Path of Travel feature allows you to select a “start point” and an “end point”. Revit will then automatically calculate the shortest path between the two points. That means it will avoid walls and try to find doors. This “Path of Travel Lines” can be tagged. In the image below, we created a new custom tag to indicate the length of the path. By default, the path of travel lines will use a unique, custom linestyle. You can use this default linestyle or select another one in the instance properties of the Travel Lines. You could use various line styles for different paths. By default, the travel path will avoid any object. In the example below, we add a furniture element. Select the travel path and click the “update” button. It will adjust to this new object. You can assign which model elements can be considered as “obstacles” to be avoided. Click on the small arrow just below the Path of Travel tool in the Analyze tab. Then, uncheck any categories you don’t want to be used by the automatic path calculation. Revit will also ignore all hidden and demolished elements. At the bottom of the view, specify a height interval in which the elements will be used in the travel path calculations. That means elements above or below this range won’t affect the path. Filters can also be used to color the path of distance lines. In the example below, we set a red filter to all travel path lines that exceed 12 meters. Finally, Path of Travel lines can be scheduled. In the example below, we create a schedule for the plan above. I was surprised by how much information can be used here. You can set a speed to calculate how long it will take someone to get out using a specific travel path. There is also a “To Room” and a “From Room” feature but it doesn’t seem to work at the moment… unless I’m missing something. This is a really fascinating feature… kudos to the Autodesk team. If you go to the Insert tab in the ribbon, you will find a brand new Import PDF tool. Yeah! The PDF will be imported as a 2D object in the current view only. You have to specify which page you want to import each time you select a PDF file. You can also specify a DPI import value. If the PDF contains vector lines, you can use the Enable Snap feature to interact with the lines using tools such as “pick lines”. Once the snaps are activated, you can use the “pick walls” tool to use the PDF as a reference to create new walls and other model elements. The PDFs can be managed from the Manage Images menu. This tool can be found in both the Insert tab and the Manage tab. There was no simple way to create walls following an elliptical shape. The only workaround was to create a mass and then a “wall by face”. A sloppy and inefficient process. The elliptical wall feature is now directly integrated in Revit. To edit the scope boxes, you had to enter a view and modify the instance properties. If you have a lot of views, this can be a long process. You can now add the “Scope box” parameter in a “view list” schedule. That means you can quickly assign scope boxes without having to manually enter a view. Useful for projects with a lot of views. Make sure to add the “Scope Box” parameter in the fields of the view list. As you see below, all scope boxes can be assigned from here. Importing a sketchup file was inefficient. Imported materials names were changed to Render Material followed by a RGB code. Importation was limited to prehistoric versions of Sketchup. Sketchup 2018 files can now be imported. Colors and transparency will act in a more consistent way. Sadly, the colors in Realistic visual style won’t use the Sketchup colors and everything will be set to RGB code 80-80-80. The material names from imported sketchup files are acting in a much more consistent way. 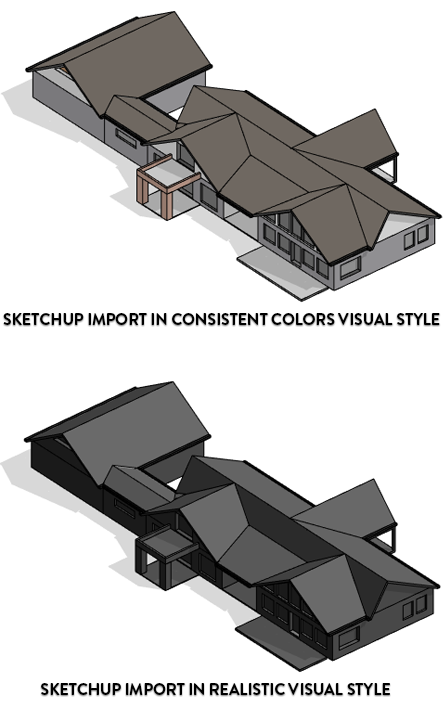 Instead of creating a “Rendering Material” with a RGB code, Revit will keep the sketchup name or color name. 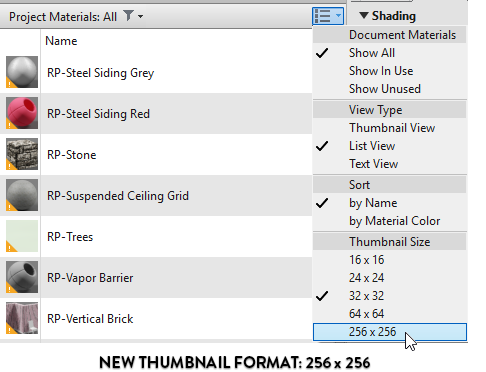 Also, you can set the material filter to “SKP” to only see the imported sketchup materials. The only way to add a legend to a sheet was using the “Place View” tool or to drag the legend view from the project browser. Adding a legend to multiple view could be a long and annoying process. Legends can now be copied from a sheet to another. You can select the “Paste Aligned To Same Place” feature to make sure legends are in the exact same spot on all sheets. Do you like this blog post? Make sure to check out our popular BASICS package to help you learn Revit in simple, fun and efficient way. 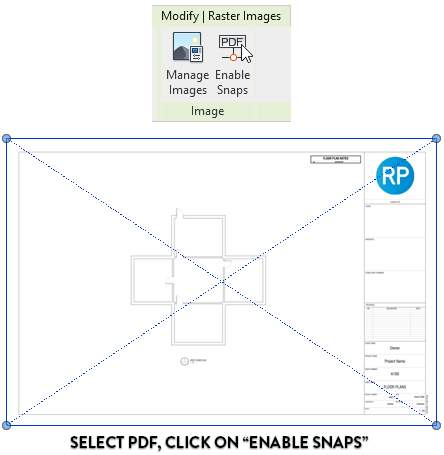 Images that are imported and linked into Revit can be managed more easily. The Manage Images menu will display the file format, the original image dimensions and DPI. You can also select the path type to be based on Absolute, Relative or Cloud. Let’s say you are creating a filter that include multiple categories. In this example, Walls and Windows. If you are using the OR rule, you can only use parameters that are common to both categories. That means you can’t select category specific parameter like “length” for wall. In the new version, you can assign each OR rule to a specific category, allowing you to choose specific parameters. As you can see in this example, we can set the category to Walls and use the Length parameter. You can also select “All Selected Categories”, which will act the same way as the default mode in Revit 2019. Make sure to check out our guide about Filters. The material libraries icon has been modified to be more visible. If you are the kind of person that enjoys large thumbnails, you will be pleased to learn that you can use them in the material library browser. 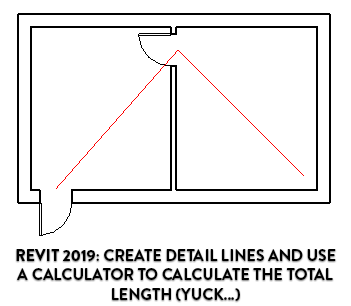 Revit 2019 introduced brand new appearance assets that were supposed to be “more realistic”. Some of the new assets were good, but it was certainly not a revolution. Revit 2020 expanded the library with 104 new appearance assets using physically based definition. Some of the new assets include floorings like in the image below. Some of these assets seem promising but further testing will be required to see if they are worth it. Some useless information at the top of the screen was removed, leaving more space for long file names. Revit has a new feature called “Cloud Models For Revit”. It can be accessed in the “Save As” menu. It allows any model to be saved directly to the cloud, including models that don’t have “worksharing” enabled. Sadly, you need to meet a lot of criterias for this feature to work. You will have to pay for a BIM 360 Docs subscription (420$/user/year). Revit is already expensive, why not offer this feature for free? And why is the whole cloud interface so complicated? BIM 360 Glue, Collaboration for Revit, Cloud Models for Revit, BIM 360 Docs. It’s hard to understand what is the difference between all these services. A new “Elevation From Level” parameter can be used for various families. You can create a tag in plan views to indicate the height of various families. In the example below, we use a tag to indicate the relative height of casework families in a plan view. Dynamo is now directly integrated into Revit. Older versions of Dynamo are not compatible with Revit 2020. If you enjoyed this guide, check out our brand new free pamphlet publication. It contains 24 pages of tips about Line Weights in Revit. Pamphlets are published 4 times a year by email.